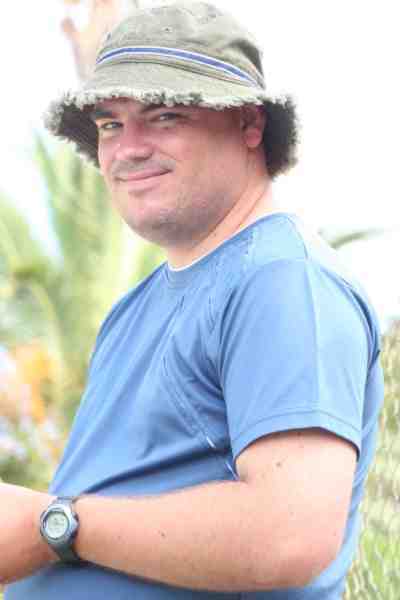 My name is Weiers Coetser. 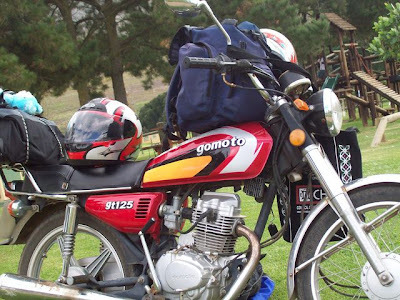 I bought myself a Gomoto GT125 cc motorbike and have big plans for it. 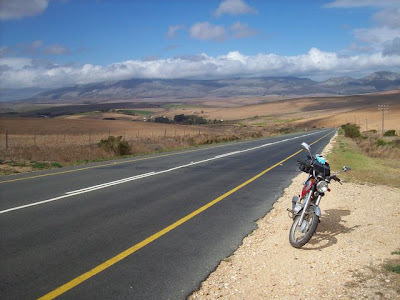 This blog is my account of my experiences on the bike and the life that surrounds it. I currently live in Northern Ireland. I'm starting up a new relationship with a new consumer commodity: A Toyota Aygo. I dreams are that it will take me to see a few interesting places. I hope to blog about it here. Well, it is two months since I sold my Gomoto for R1600.00. At the time that I sold it the frame had begun to rust (because I made it sleep outside too many nights). The battery was flat and the back tyre had a puncture. The state of disrepair was partly the result of me not looking after the bike as I should. I had allowed the stresses and strains of my life to take over and this was even visible on this blog. I have decided to try something new. I moved to Northern Ireland. I live in a small town, Banbridge in County Down. I work as a pastor of two congregations of the Seventh-day Adventist Church. Twice a week I drive to Larne, another small town on the County Antrim coast. On the way there I drive past this garden feature on one of the roundabouts (We call them "Traffic Circles" in South Africa). It always makes me think of my days on the Gomoto and I really do miss them. I will probably begin a new blog soon and post a link here. Exactly what theme it will take is still uncertain, but I am playing with the idea of toilets and toilet paper. I might call it "2-Ply". I doubt that many people would read it, but I need a place to document some of my experiences. For now, I can only thank Gomoto for the good experience I had on one of their bikes. One day I'll return and buy myself a new one. Thanks to all my readers. I hope you enjoy your Gomoto's and please try to be adventurous as possible on them. It did take a while, but I eventually got the attention of somebody at the Altech Autopage Shop in Somerset West who was able to address my service problem in a way that gave me some insight into what was happening and with very good results. When the right person got onto the case I received 4 e-mails in three days indicating what was being done to solve the problem. It does seem as though a third party service agency had not managed the repair of my cellphone very well. They are still waiting for a spare part after 11 weeks. They have also not been communicating very well with the Altech Autopage people in Somerset West. I don't know what had to happen to accomplish this, but the last e-mail that I received gave me the option of waiting for them to fix the phone or accepting a new phone from them. The new phone that is being offered is a Sony Ericksson K810i. It seems as though I will now be able to listen to music and take pictures with my phone while I do road trips with my Gomoto. I should receive the phone some time during this week. I must admit that I am quite pleased. It has been frustrating to wait so long for a resolution to my issue with a broken phone, but I feel that the company eventually dealt with the situation very well and I feel that I could recommend them to my friends as people who do provide reasonably good service. I interrupt the silence on my blog to just complain a bit. In the three years that I have lived in Somerset West, I have had nothing but bad service from the Cell Phone company that I subscribe to. So on 29 February 2008 I ventured down to Altech Autopage in Somerset West, Main Road (Also known as Kalstra) to hand in my favorite phone. I did not realise that I would be seperated from my phone for a long period of time. The shop did not have a loan phone and said that I should just find another phone for myself while they fixed this one. Anway. It is now 1 May. More than 8 weeks have passed. I have made numerous phone calls and visited the shop personally. And I still have absolutely no indication of where my phone is. Have they lost it? Are they waiting for a spare part to come in? Why has it not been fixed? I am given no information and absolutely no promises. Each time I contact them they say that they need to wait until Tuesday to see if the phone comes in. Then Tuesday comes, they don't call me to give me a report. I call them, and I am told that it might be ready the next week. I am disgusted with the service. The people who run the shop are rude and will only respond when I become upset with them. They are not serious about keeping their customers. I have two contracts with them. I will be cancelling one this month, and I cannot wait for the next one to come to the end of its term so that I can move to somebody else who will serve me better. 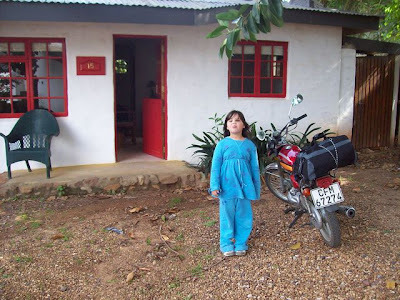 Robert M. Pirsig took his son on a road trip with a motorbike when he was 11 years old. He traveled several thousand miles through America over a period of 17 days. 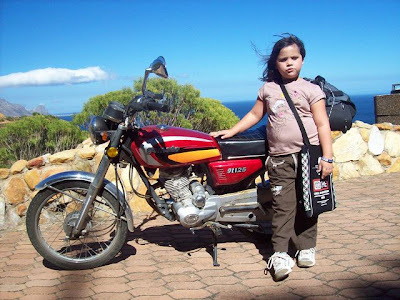 I just returned from a road trip with my 7 year old daughter on a Gomoto. It lasted three days. My wife was busy preparing for school. She had not worked as hard as she should have during the holidays. She was also adamant that she would not be able to do something in the week of public holidays that were to come. So on a whim I drew the last bit of money from my bank account and made hasty bookings for accommodation. At 11:00 on 12 April, I pulled away from my flat with a backpack, a bag, a 7 year old daughter and a teddy bear on my bike. Pirsig spent his time on the road meditating in a Zen-like fashion on the metaphysical concept of quality. I took with me a book on the life of Tenzin Palmo, a Bhuddist nun. She was not really into Zen, but her remarkable life story really had a lot of food for thought. First Stop: BP Garage to put oil into the motorbike. I've been a bit negligent. My motorbike is due for its 7000 km service. I have not taken it yet. And it did not dawn on me earlier that I might suddenly decide to do a road trip without doing any planning. Fortunately I checked the oil levels before I left. 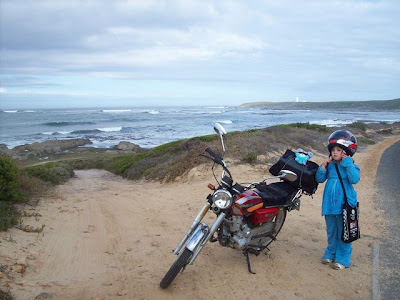 11 Years of age might be the optimal age to take a child on a motorbike road trip. 7 Years is a bit risky. I managed to make it about 35 km's to the highest point of Clarence drive before my pillion became restless. So we stopped for some juice and the first photo. Stops were relatively frequent. In fact, the whole road trip was characterized by stops. Betty's Bay for a toilet break. 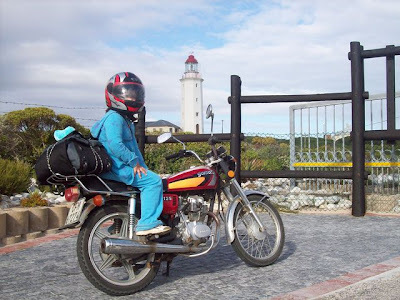 Hermanus looking for refreshment, but not able to find any due to Eskom's load shedding. Stanford because everything was now just too much and she was tired. And finally, at 15:30, Gansbaai, our destination for the first day. 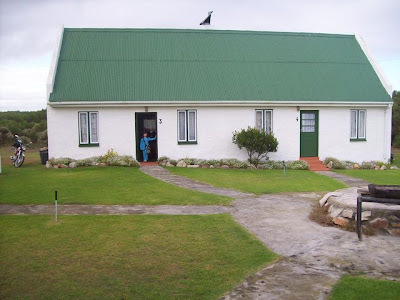 We stayed over at Birkenhead Lodge, a comfortable self catering cottage just outside Gansbaai. The cottage 6 single beds in it, an open plan kitchen with a fire-place in the kitchen, a television. There is also a communal games area and swimming pool. My main complaint was that the establishment does not seem to cater for non-smokers. There are ashtrays everywhere. As somebody who has never smoked or lived with somebody who smokes, I picked up the stale smell of cigarettes in practically every room, in the linen, in the games area... everywhere. Isn't there a law against smoking in places like these? I found it rather unpleasant. One of the neat little buildings comprising Birkenhead Lodge. 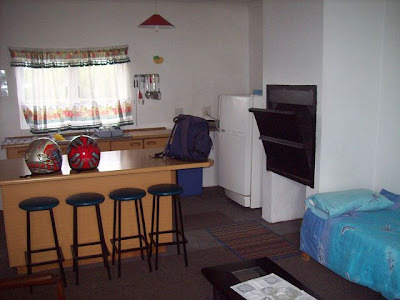 The interior of the cottage that we slept in. Due to obvious challenges with space on the Gomoto, I did not carry any food with me. When supper time came I almost had a mutiny on my hands with a daughter who did not want to get onto the Gomoto to go look for food. A whisper of the word "Wimpy" did the trick, however, and fortunately this eating place was only 3 minutes drive away. The heartburn lasted all night however. The next morning we were quite happy to get onto the Gomoto again. Before embarking on the road to our next destination we explored the coastal area around Danger Point where the historical HMS Birkenhead hit a rock in 1852. Several hundred people perished on that night. Unbeknown to us a similar tragedy was taking place a very short distance away from where we were riding with our bikes. A catamaran, carrying 9 tourists to a shark cage diving adventure was struck by a freak wave. It capsized and 3 tourists lost their lives in the incident. On the way out of Gansbaai we were passed by two emergency vehicles hastening to that scene. One of my goals for the road trip was to try to see some birds. I took my binoculars with me, but I did not remove them from the bag once! The challenge was to keep the seven year old passenger happy. And I was ready to thank the deities of all parents who take their children on a Gomoto Road Trip when I came upon Klein River Cheese, just outside of Stanford. They have a beautiful picnic site with lots of activities designed for bored motorbike passengers. We spent 45 minutes there and ate another ice cream. Then we hit the road to Caledon. Again the motorcycle angels sent us some entertainment. 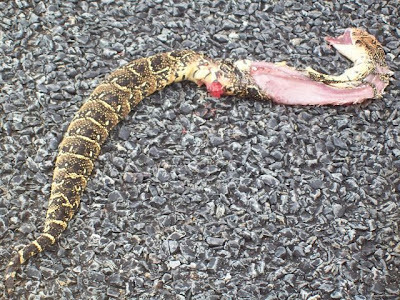 We found poor herp on the road and I was able to engage in some intellectual conversations on biology, ecology and metaphysical questions on death. As soon as I can find the exact Longitude and latitude for this location (exactly 15 km's out of Stanford towards Caledon/Riviersonderend), I'll post the picture on the website for herpetology in Southern Africa. Finding a place to eat on a Sunday Afternoon in Caledon is a challenge. I finally found a restaurant at the entrance to the flower garden and we had pizza for lunch. We eventually made it to Greyton, our destination for the day, by 14:30. 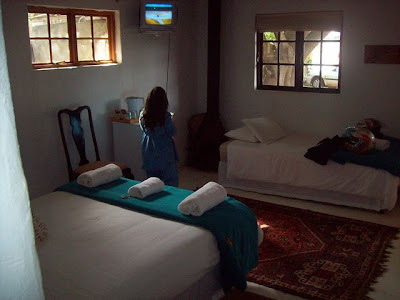 In Greyton we stayed at Auberge B&B. For somebody who does road trips on a Gomoto the accommodation was very luxurious! And since I live in a flat, the song of the cricket that was hiding away behind a stack of wood in the fire place was like a symphony that played through the whole night. A word of warning! Do not travel to Greyton on a Sunday Afternoon if you do not have any cash with you. There are (at least) three ATM's in Greyton. They are however all inside shops. The shops are closed on Sunday Afternoons. At 17:00 my daughter became hungry and I realised that there were no shops to buy some rolls and almost all the restaurants (there are many of them) were closed for the evening. 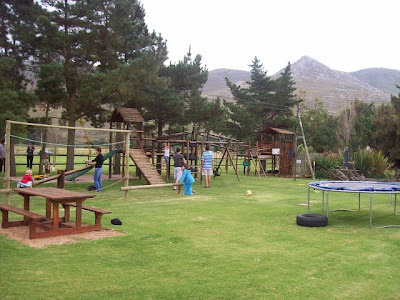 Our choice was Pizza at The Old Mill or a meal at the Greyton Lodge. I ate a vegetarian lasagna. The dogs at the Greyton Lodge are much better entertainment than any jumping castle at the Spur, or McDonalds, or Wimpy. On Monday morning the mountains had dissappeared. There were clouds everywhere. We left quite early and drove up the Riviersonderend valley to Villiersdorp. My daughter was really cold, so we drank some tea and ate some scones at a coffee shop. I felt a bit intimidated by the large fruit trucks on the road to Grabou. I decided to take a slightly longer route via Franschhoek and Stellenbosch back to Somerset West. I was 20 minutes late for my 13:00 meeting. My rear end is a bit sore. My passenger was very well behaved and enjoyed the outing with her dad. She has better rear end padding, but sounded a bit hesitant when I mentioned that I'd like to take her for another ride on the Gomoto. I cannot wait for the next opportunity. These guys did what I dreamt of from the moment I bought my Gomoto. I'm inspired! I am really inspired! Since my run in with the bad service from the Gomoto shop in Mowbray I've decided to service my bike myself from now on. So this weekend, the time came for its 2nd service and everything was going swimmingly until I opened up the airbox and noticed that there was nowhere for the air to go into! The nice thing about this is that my airfilter was obviously spotless because no dirt could get into it either. Now I don't know about you or other Gomoto users, but I've never been able to just open up the throttle any old time without the bike boggin down and losing power (especially with 2 people on it), so I immediatly drilled 5/6 8mm holes into the airbox cover and my Gomoto is now going like a dream (like it was meant to from the 1st day!) and the modification has even has added little throaty growl to tis personality. 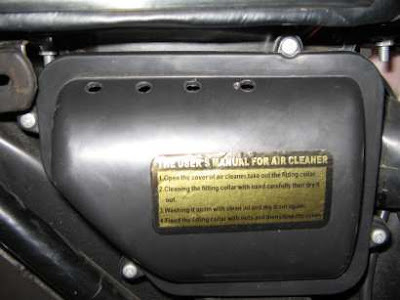 Just thought I'd let you know-if you want to see what I'm talking about without actually making the modification just remove the airbox cover for a short trip and see if it makes a difference to your bike. I thought I'd tell you about my, somewhat postponed, inevitable spokes issue on my Gomoto. Some time ago I noticed one or two broken, only through inspection, as I didn't hit a big bump or anything. I tightened them now and again, but while I casually shopped around for spokes, I had time. Then, after a long trip, along a fair mixture of roads, I noticed a slight wheel wobble going home on the Friday. The weekend was a bit blurry, as beginning of month weekends can be, but on Monday I knew I had to at least check and tighten the spokes. Many were loose, and many were broken, fifteen in fact, but Dylan (fellow Gomoto rider) had told me he had done some km with fifteen missing, so I tightened up the rest and went to work. I also started looking more urgently for more spokes. I was phoning and asking around, waiting for responses etc. until the following Friday, when the remaining spokes had enough. On the way to work my back wheel felt like a marshmallow. This was quite close to work, so I rode (almost just pushed) along at the side of the road to work, and got the local Gomoto agents on the phone. I told them to just order a full set, and I borrowed money from work to cover whatever cost. Come Monday, there was no word from the distributor, in fact only by the next Friday there was there word: they had sent the agent a fully laced new rim. I asked the agent if I was obliged to buy the whole new rim, and he grudgingly conceded that he could de-lace it and sell me spokes at R10 a spoke, but I would have to do my own lacing, or pay his three hours of labour for lacing. He wanted R550 for the whole rim, which I jumped at. Today I fetched it on the way to work with my lift. When I got to work it took me less than five minutes to remove the back wheel and ready it for swapping the tyre. I planned on taking it in to a nearby bike shop to have them swap it, but they couldn't do "while-I-wait", and I couldn't get two lifts there, to drop off and fetch, and still be sure I finished today, so I phone my dad and asked him to bring some tyre leavers. He only had one, so he brought a crowbar as well, and it took the two of use about ten minutes to swap the tyre to the new rim. Then it took about the same for me to replace the back wheel and have the bike functioning again. In fact I'll probably never consider using a shop again for a job like this.